Some of the answers offered have to do with the order of the words of the Torah. For example, the first two words of the Torah—B’raysheet and Bara—both begin with a “bet” while the second two words of the Torah—Elohim and Et—both begin with an aleph. A Midrash ponders why the Torah didn’t start with the word Elohim, one of the names for God. Instead, says the Midrash, God chose to start the Torah with two “bet words” and two “aleph words,” in that order. Why? To demonstrate right from the beginning that the Torah cannot be predicted and is written without chronological sensibility. We might think that the Torah is like an encyclopedia or a history book. Rather, it should be read like a love letter that is overflowing with emotions and ideas. A “bet” is closed on three sides—top, right and bottom—and open on the left side. This suggests that the Torah is concerned with everything that happens from the moment of creation onward. It is a book about our struggling to know God, to cultivate faith, and to find our way. The vertical stroke on the right symbolizes a barrier. We cannot know what came before creation or how God came into existence. These questions are intriguing but they are not the concern of the Torah. The vertical stroke of the “bet” also represents God’s back. In the Book of Exodus (chapter 34), after the episode of the Golden Calf, Moses seeks to know God face to face. God tells him that he will not survive the encounter, but tells him to place himself in the cleft of a rock as God passes by with his back facing Moses. References to God’s physical existence are common (God’s hands and arms are mentioned in the Torah), but these are considered metaphorical. Indeed, a core teaching of Jewish theology is that God has no physical presence in any way that human beings can comprehend. What could it mean to say that Moses saw God’s “back?” The Chatam Sofer (Moses Schreiber, 1762-1839, Germany) answers we cannot see God directly. All we can see is what comes after God, the difference in the world that is felt because of people of faith who do good things because they believe God expects it of them. Thus, the Torah starts with a “bet” to teach us that the impact of our faith is in the good we do for the world. 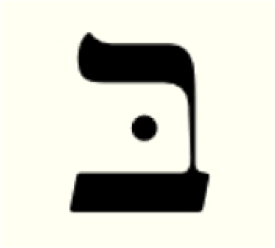 B’raysheet bara Elohim…In the beginning, God created…Only a single letter can hold a myriad of meanings. Imagine what the rest of the Torah holds in store for us!